The signature neon-and-smoke Blade Runner aesthetic is all over video games, from Hideo Kojima’s 1988 Snatcher to more recent efforts like the Deus Ex series, Gemini Rue, and futuristic bartending sim VA-11 HALL-A. In games, Blade Runner and cyberpunk are synonymous. Over at Kotaku, Peter Tieryas talks with the folks behind the only two games directly adapted from Ridley Scott’s 1982 classic. In 1985, an 8-bit Blade Runner game came out for the Commodore 64 and ZX Spectrum, but publisher CRL Group PLC was actually unable to secure the rights to the film; as a workaround, it’s technically based on Vangelis’ soundtrack. 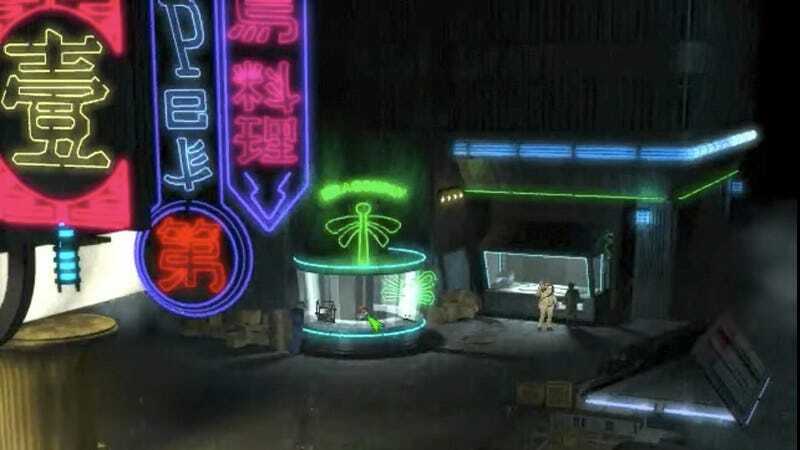 The more popular, and better, adaptation is Westwood Studios’ 1997 Blade Runner, a point-and-click PC game that pulls some interesting Silent Hill 2-style tricks with player perception and choice. Blade Runner ’97 still looks impressive, too, thanks to the fixed camera angles, atmospheric lighting and smoke effects, and voxel-based rendering—a technique still unusual today. With Blade Runner 2049 on the horizon, which we’re excited about, it’s worth playing a bit of these games to get yourself in that replicant-huntin’ headspace.